Earlier this year Sustrans held consultation events in Ilkeston and Awsworth to publicise their plans to restore the historic Bennerley Viaduct and reuse it for a cycling and walking link between Nottinghamshire and Derbyshire. 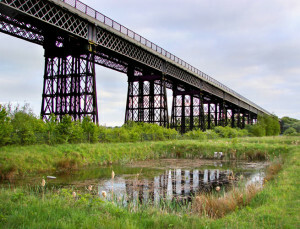 The 1,452 foot long bridge would be used as part of a through route between Nottingham and Derby, and with good connections to both sides of the Erewash valley, including the Erewash Valley Trail, connecting Langley Mill with Trowell Lock and Attenborough etc. Bill Tomson has since May last year been working on these proposals as the Project Officer with Sustrans at their regional office in Nottingham. Following this successful public consultation Sustrans plans to apply for Heritage Lottery Grant funding. 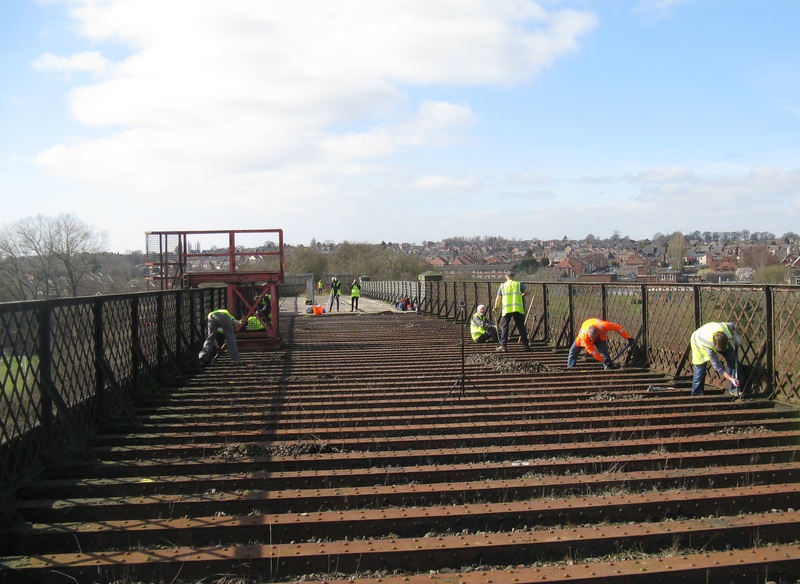 A first bid to be submitted this summer will focus on community engagement activities to promote the project and the viaduct’s heritage widely in the local area, including schools. It is hoped that this will be followed by a major bid to the Heritage Lottery Fund next year focusing on the restoration and route creation works. 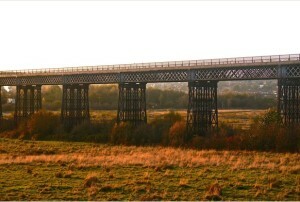 On 18 June a meeting was held in Ilkeston to discuss the formation of a Friends of Bennerley Viaduct group to support Sustrans with these bids and the practical tasks by working parties already begun (see picture by Bill Tomson) and monthly meetings are now planned to follow this up, with representatives of all the many different interests involved with this project. 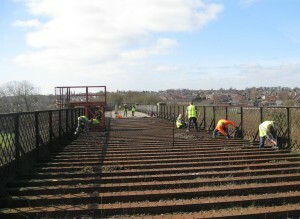 The next working party is due to take place on Saturday 8 Aug. If anyone is interested in joining in, please email Bill Tomson <Bill.Tomson@sustrans.org.uk>. Or email Bill if you can’t make it on the 8th but want to attend future workdays. 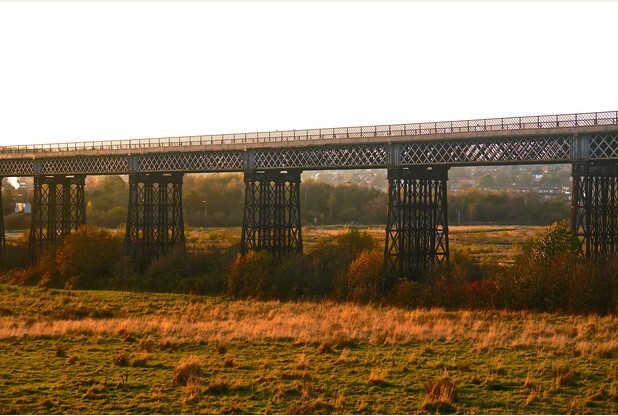 Bennerley Viaduct prospectus PDF. This dates from 1986 and was produced by the Bennerley Viaduct Preservation Trust – a group of activists who helped save the viaduct from demolition.